If you're the type of person who loves to overthink it when it comes to filling out a bracket, this is exactly the story for you. If you're the type of college basketball fan who loves to sift through the stats, this is exactly the story for you. If you're the type of March Madness maniac who just can't get enough of the buildup to the start of the tourney and wants as much college hoops content and nougaty goodness as possible, this is exactly the story for you. Behold, my annual cornucopia of facts, stats and nuggets to help bring some slants, angles and perspective to this 2019 NCAA Tournament. There is no secret formula here, only facts and trends that can -- maybe -- influence a pick or 10 in your bracket. Do with these numbers and bits of trivia what you please. I wish you stress-free bracketing. Highest-scoring team: Gonzaga (88.8 points per game). Lowest-scoring team: Kansas State (65.8 points per game). Fastest team: North Carolina (74.3 possessions per game). Slowest team: Virginia (59.3 possessions per game). Best free-throw shooting team: Mississippi (78.3 percent). Worst free-throw shooting team: Saint Louis (59.8). Best 3-point shooting team: Wofford (41.6). Worst 3-point shooting team: Duke (30.2). Over the years, teams that have won it all have checked a lot of boxes. You can make the stats tell you a lot of things you want to hear. But if you've got a top-40 per-possession D and a guard that's projected to be drafted, you've got a solid shot. Only a handful of teams meet this criteria each year. Ten apply now. Four have two clear draft-worthy guards. 81: This is the 81st NCAA Tournament. Thirty-five programs have won a national title dating to 1939, when Oregon won its only championship. All four teams from the first Final Four are in the field this year: Ohio State was runner-up; Villanova and Oklahoma were semifinalists. The Ducks are the lowest-seeded team in the field with a national title. 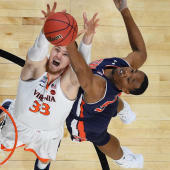 0: The Virginia Cavaliers and Gonzaga Bulldogs are the highest-seeded teams in the field without a national title. 9/4: Duke's odds to win the national championship. It's the favorite. 45.7: The percentage of brackets at CBS Sports that have Duke winning it all, by FAR the most popular pick. 17.3: According to our Bracket Voodoo forecast, that's Duke's percentage to win the title, tops amongst all teams. For perspective, 2018 No. 1 seed Villanova was 18.5. In 2016, Kansas was slated at 29 percent at the start of the tournament. In 2015, then-undefeated Kentucky started the tournament at 41 percent. The top five for 2019 are Duke (17.3), Gonzaga (15.7), Virginia (15.7), North Carolina (14.2), Michigan State (10.2). 1: Only three times has the No. 1 overall seed won the NCAA Tournament since the selection committee began ranking the No. 1s in 2004: Florida (2007), Kentucky (2012) and Louisville (2013). The No. 1 overall seed has also lost in the second round thrice -- and the first round once. (UMBC forever.) Duke is this year's No. 1 overall seed. Virginia is a No. 1 again, getting its seventh in school history. 14: Michigan State has 14 wins against teams in the field, the most of any team participating. Teams with no wins against 2019 tournament teams: North Carolina Central, Prairie View A&M, Fairleigh Dickinson, North Dakota State, Iona, Gardner-Webb, Bradley, Abilene-Christian, Georgia State, Colgate, Northern Kentucky and Northeastern. 11: New Mexico State has lost 11 straight NCAA Tournament games. The Aggies are a 30-win team this season and a No. 12 for the second year in a row. 0: Infamously, no team has lost its first conference tournament game and then won a national title. This year, you should be suspicious of Texas Tech, Purdue, LSU and Maryland. 12 of 21: In the past 21 years, 12 national champions won their conference tournament. Amazingly, only two teams on the top four seed lines just did that, and they're both in the same region: Duke and Michigan State. 31: Houston and Buffalo have the most wins of all other teams in college basketball. Those two, plus Virginia and Gonzaga tie for fewest losses with three apiece. As for the most losses in the 2019 field, say hello to 18-15 North Carolina Central, which faces 18-15 North Dakota State in Dayton on Wednesday. Iona, at 17-15, was spared Dayton but gets UNC on Friday night. There is a fourth team with 15 losses in the field: No. 10 Florida. 20: Wofford's winning streak of 20 is the longest of any tournament team. The last time the Terriers lost was Dec. 19 at Mississippi State. All four of Wofford's losses came to teams seeded ninth or better: Mississippi State, North Carolina, Kansas and Oklahoma. 7-0: The best neutral-court record in college basketball this season belongs to Villanova and its 7-0 mark. 0/19: Oklahoma is the only team this season to not have faced a Quad 4 opponent. It's why the Sooners, in some part, were gifted a No. 9 seed despite finishing so far back in the Big 12. Kansas, meantime, faced 19 Quad 1 opponents, the most of anyone in college hoops, and went 11-8 in those games. -25: North Carolina's line against Iona -- for now -- is the biggest of the first round. When Duke gets matched up with its No. 16 seed, chances are good that will become the largest line. Here's every line for every Thursday and Friday game. 5: Coaches with top-four seeds to never have made a Final Four. Will Wade, since he is not coaching, does not apply for LSU. Last year, Porter Moser and Loyola-Chicago stunned, putting Moser ahead of the prestigious list of names above. 69: Combined NCAA tourney wins from Tom Izzo, Mike Krzyzewski and John Calipari over the past nine seasons. Nice. Izzo, Krzyzewski, Dean Smith, Lute Olson, Bill Self and Mark Few -- this year -- are the only coaches to make 20 straight NCAA Tournament appearances. Krzyzewski's in his 24th straight, which is a men's Division I record. 23.1: Average margin of victory for No. 1 seeds over No. 16s in the modern tournament. No. 1 seeds are 135-1. R.I.P. to my column: We will never again have the carrot of a No. 16 over a No. 1. 6 or fewer: Can a No. 16 do it again? Not including UMBC's win last year, in seven instances, a No. 16 seed has finished a game within two 3-pointers of a No. 1 seed. Those results were: 2013 Southern vs. Gonzaga (64-58); 1996 Western Carolina vs. Purdue (73-71); 1990 Murray State vs. Michigan State (75-71 in OT); 1989 McNeese State vs. Illinois (77-71); 1989 East Tennessee State vs. Oklahoma (72-71); 1989 Princeton vs. Georgetown (50-49); and 1985 Fairleigh Dickinson vs. Michigan (59-55). 2016: The last time all four No. 1 seeds reached the Elite Eight. Before that, it was 2009. 2009: The last and only other time one conference had as many as three No. 1 seeds. It was the Big East; Pitt, UConn and Louisville all did it. None of those teams are in the Big East anymore. 2008: Famously, the only time all four No. 1s reached the Final Four. But since 2010, only 12 of the 36 Final Four appearances have come from No. 1 seeds. 1-4, Thursday and Friday: You almost never wanna go all chalk at the top on Thursday and Friday. In 2017, all 1s 2s, 3s and 4s won their first round game. Prior to that, the last time that happened was 2007. It's happened just six times since 1985. 56 vs. 50: No. 1 seeds have made the Final Four 54 times. That's more than the combined Final Four showings of Nos. 4-16 since seeding began (50). No. 2: Only one time in the past 22 NCAA Tournaments have all four No. 2 seeds made the Sweet 16. This stat always rocks me. And it's happened just four times since 1985: '89, '95, '96, '09. Pick at least one No. 2 to lose. It's probably going to happen. 12: Every seed, from 1-11, has made a Final Four. When does a No. 12 do it? New Mexico State, Murray State, Liberty -- all from traditional single-big leagues -- are up next, in addition to Oregon. 7: Though 7-10 games feel like 8-9 games, they're not. No. 10s have never swept the No. 7s with the exception of one year. No. 8 seeds are 68-68 vs. No. 9 seeds all time. 63.7-to-1: Per bracketodds.com's calculator, those are the chances we'll have four No. 1 seeds reach the 2019 Final Four. If you go to all 2 seeds, it's 366.5-to-1. Three No. 1s and a No. 2 is 23.97-to-1. 9,223,372,036,854,775,808: The number of different possible bracket outcomes. Wondering how to pronounce that number? I got you. That would be nine quintillion, two hundred twenty-three quadrillion, three hundred seventy-two trillion, thirty-six billion, eight hundred fifty-four million, seven hundred seventy-five thousand, eight hundred eight. It's much larger than the number of possible outcomes seen by Doctor Strange in Avengers: Infinity War. Spoiler alert: your bracket's getting Thanos'd. 8: The Big Ten's eight bids lead all conferences. 29: Clemson, 29th at KenPom, is the highest team in that metric to not make the tournament. There is a weird pattern developing. Saint Mary's -- in this year's field via auto bid -- was the highest-rated team in 2018 and 2016 to be left out. In 2017 and 2019, it's been Clemson. Kind of interesting. In 2017, Clemson was 35th on Selection Sunday. 33/73: With the RPI dead, we can now track notes on the NET. NC State's No. 33 NET ranking makes it the highest-rated team to not make the field, while St. John's at 73 makes it the lowest-rated NET team to earn an at-large. We'll need at least a five-year sample size to start really getting a handle on the true extreme barriers on this metric when it comes to invitations to the Dance. 19 of 20: A top-three seed has won the national title 19 of the past 20 seasons. 7: Eight years running, a No. 7 seed or lower has cracked the Elite Eight. It's going to happen again. Make your move and hope. 6: Buffalo's No. 6 seed is the best for a MAC team in the history of the league since the field expanded to 64 teams in 1985. Four for 16: Gonzaga's made the Sweet 16 four straight seasons. No other team has a streak that long. 27: It has been 27 years since a No. 6 seed made the Final Four. Who was it? Chris Webber and the Fab Five at Michigan. 38: For the first time in 38 years, Arizona State has made back-to-back NCAA Tournaments. Wild, right? And Virginia Tech is in its third straight tournament for the first time in program history. 0-of-7: Belmont is a darling Cinderella pick, but the Bruins have yet to win an NCAA Tournament game. This is just the second time an Ohio Valley team has earned an at-large, joining Middle Tennessee in 1987. +.126: Georgia State, a 14 seed facing No. 3 Houston, rates as the "luckiest" team in the field, per KenPom. In the past 17 NCAA Tournaments, the luckiest team in the field lost its first game 14 times. But you know who was statistically the luckiest team before the start of the 2018 tourney? It was UMBC. 22: Tennessee has the most NCAA Tournament appearances (22) of anyone in the field to not make a Final Four. 24/22: Tennessee coach Rick Barnes will be making his 24th appearance in the NCAAs. So, you read that correct -- that's more than Tennessee has as a program. 2,603: The distance as the crow flies from Moraga, Calif., to Bradley International Airport in Windsor Locks, Conn. That's what Saint Mary's has in front of itself. The Gaels have the longest trip of any team in this year's field. 14: A No. 14 has beaten a No. 3 in four of the past six NCAA Tournaments. 7 > 8: Seeding matters. A 7 seed has made it to the Sweet 16 27 times since 1985, including twice in 2018. Contrast that to a No. 8, which has only gotten there 13 times. Heck, 10 seeds have reached the second weekend 23 times since the field expanded to 64 teams. You want that 2 instead of a 1 in the second round. 13: Iona is making its 13th NCAA Tournament appearance. In this field, it has the most Big Dance showings without ever winning a game. The Gaels are seeded 16th and will play UNC on Friday. 2: The number of teams making an NCAA tourney debut. Welcome to the club, Gardner-Webb and Abilene Christian! 0 for 37: The Northeast Conference is still the only league that has never won a game in the first round. Fairleigh Dickinson needs to go through Gonzaga to overcome the streak. 29: Most consecutive NCAA tourneys: Kansas (30), Duke (24), Michigan State (22), Gonzaga (21). Kansas' Bill Self, laughably, is coaching his 19th straight NCAA Tournament as a No. 4 seed or better. 18: Combined national championships for programs in the Midwest region, the most of the four regions. 3 for 3? : The previous two times Minneapolis -- site of this year's Final Four -- had hosting duties (1992, 2001) Duke won the national championship. 2nd: Michigan and Montana will play each other in the first round for the second consecutive year. It's weird but not unprecedented. This happened to BYU and Texas A&M in 2008 and 2009, happened to Providence and USC in 2016 and 2017. The selection committee shouldn't let this happen. 44: A No. 12 seed has won 44 first-round games since the field expanded 1985. The 1988, 2000, '07 and '15 and and '18 tournaments are the only ones since the field expanded to not have a 12 seed win. In the past decade, 12 seeds are 16-24 vs. 5s. Don't overlook the 11s, though. That's still a real upset, and in the last three years, 11s are 8-4 vs. the 6s. .777: Michigan State coach Tom Izzo's win percentage in the second round and Elite Eight. He is 21-6 in those games (i.e., on two-day turnaround). Keep that in mind, as MSU would face either Louisville or Minnesota on Saturday. MSU faced both of those teams this season, losing at Louisville but winning vs. Minny. 22-17: Since seeding the field began, No. 1 seeds have more national titles (22) than the rest of the seeds combined (17). 10-15: Pick at least one double-digit seed to reach the Sweet 16, because it has happened all but two years since '85 (1995, 2007). And 15 times there have been at least three double-digit seeds who made the Sweet 16. 7: Since 1980, there have been seven reigning champions who've made the Final Four the next season. Villanova is in a tough spot here. In fact, Florida was the most recent, the Gators winning back-to-back in 2006-07. 8 for 8: Hate the First Four if you must, but the run continues. Every season since the field went from 65 to 68 teams, a squad that emerges from the First Four wins at least one game afterward. Last season the winner was Syracuse. So, will it be Belmont, Arizona State, St. John's or Temple into, minimally, the second round this year?